Age: Not exceeding 35 years as on normal closing date. Note 1 Relaxable for other Government servants up to 5 years in accordance with the instructions or orders issued by the Central Government. Note 2 For those incumbents holding the post of Research Assistant/Technical Assistant/ Senior Technical Assistant/ Assistant Research Officer on regular basis on the date of commencement of these RRs, the age limit shall be Not exceeding 50 years. No further age relaxation shall be admissible. 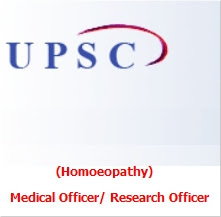 (i) Degree in Homoeopathy of Recognised University/ Statutory State Board/ Council or equivalent recognised under the Homoeopathic Central Council Act, 1973 (59 of 1973). (ii) Enrolment on the Central Register of Homoeopathy or State Register of Homoeopathy. Note Qualifications are relaxable at the discretion of the Union Public Service Commission in case of candidates otherwise well qualified. To work as a doctor in CGHS Dispensaries and as Research Officer in Ministry of AYUSH. Head Quarter Department of AYUSH, New Delhi. I. Scheme of the Test: (a) The test will be of two hours duration and will carry a maximum of 300 marks. (b) The test will be objective type questions with multiple choices of answers. (c) All Question s will carry equal marks . (d) The medium of the Test will be English only. (e) There will be penalty for wron g answers. Every wrong answer will carry a deduction of one- third of the marks assigned to that question. If no answer is marked for a question, there will be no penalty for that question. II. Syllabus of the Test: (a) The syllabus of the question paper shall broadly cover: All the core areas norm ally included in the Bachelor’s Degree of Homeopathy Medicine and Surgery programmes of India Universities.